Ensure you are clear on aspects of your painting project! Are you a do-it-yourselfer who has an interior painting project soon? Unless you have adequate experience with painting, you probably have some questions for your upcoming project. In order to get the best results possible, you want to be clear on the entire painting process. To clear up any confusion you have, here are some commonly asked painting questions and answers! What Is The Best Kind Of Paint? The answer to this question is rather subjective. If you surveyed a large group of people, you would probably receive varied responses. However, there are two major types of paint available today: oil based and water based. Water-based paint is known primarily for its sheen that it possesses and is ideal for painting a room. Compared to oil-based paints, it has less of an odor and dries much faster. Also, paints that have eggshell or matte finishes are always great options for walls. Should I Go With A Name Brand? You should only ever buy name brand paints. This is because you should be able to expect great results with a name brand paint. In many cases, generic paints don’t always yield the best results. 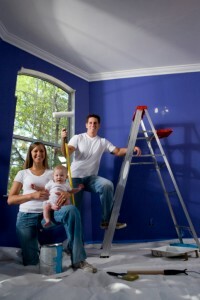 Once you decide on the kind of paint and color, you are going to need to determine how much paint you will need to buy. Many homeowners make the mistake of buying too much paint initially. It is important to remember you can always go back and buy more! More than likely you are buying your paint locally, so it probably not even that far of a trip if you realize you need another can or so. However, the general rule of thumb is one gallon for 350 square feet of surface area. There are only a few reasons why a person would need to use primer for their interior painting project. For one, if your walls are badly stained or marked from spackling. If that is the case, they could probably benefit from a primer. Another could be that you are painting over a dark color with a lighter one, in which case you will want to use a primer as well.